What is the importance of writing skills in our life? Essay and speech. There is a huge importance of writing skills in our life. This essay and speech highlights how it plays a good role in our life. The creative outflow of writing is a skill of great value. For a writer, nothing can excite him more than a blank page as the possibilities of the stories that can be etched on the white pages are endless. But, sadly for many, the most difficult part of writing is how to start writing, and it does not get easier from there. A non-writer will fumble to express himself and will not find the right words to convey emotions. The only remedy to learn writing is to write. The more one writes, the more adept you will be at expressing yourself and the words that once use to obstruct your flow of thoughts, those that once you could not remember at all, will start flooding out making it possible for you to express yourself clearly, not only on paper but also in speeches. The ability to write acts as stimuli for your brain, the more you write, the more words and expression will come easier to you. Capacity to write is not an isolated action and more you practice writing your communication and interaction with others will also get better. Writing increases critical thinking of an individual this, in turn, will help you in taking rational decisions, will effectuate your mental power in solving problems and would develop in you the skill of inquiry. Writing develops a critical mind. Constant writing practices will develop your integration skills and your ability to process contents and expression. Writing teaches you the value of emotions. The purpose of writing is to convey an emotion. This emotion can stem from the tragic end of a nonfiction story or the compelling product description that makes you desire an object. In both cases, writing is used as a conveyor of emotion. Good writing can make us cry and laugh; can hold our rapt attention, or can make us want to own a product. Therefore when writing it is important to keep in mind the readers feeling or rather the feeling that you want the readers to feel. Writing expresses who you are as a person. The diary blogs that you wrote or the poem that you scribbled at the end of a note has much to say about you. The best thing about writing your thoughts down is that it is permanent. Years later, if you read them, it will tell you about the mental condition you were in at the time you wrote it. By making your thinking visible writing helps in giving you a glimpse of our self. By reading your old write ups, you will get a sense of how much you have traversed and how much you have matured with time. Writing emancipates you. Our joy, grief, troubles and anguish all finds their best medium of expression in writing. If you have had a bad day, it is best to write about it. This will make you feel more relaxed and happy. In student life: Writing is the best vehicle for expression and communication for a student. For any exam or class test, writing skills are crucial for students. Good well-articulated answers not only fetch good marks but they also develop the power of students to develop coherent and critical ideas about different issues. Students who can write clearly will able to express better in a class and raise proper questions that will further the knowledge process of a class. Writing assignments and making study notes are a great way to develop strong knowledge foundation, students who have a habit of writing down notes in brief summary will gain better recall power and the reviews will aid profusely before exams. Moreover, writing skills boost creativity in a student and help them to broaden their minds and vocabulary. In professional life: For business purpose writing official letters and expressing your business need is crucial. A convoluted fumbling letter to a new client will make no sense until and unless you convey information clearly. Effective communication is a must for an enterprise and getting in the habit of writing will address the problem. 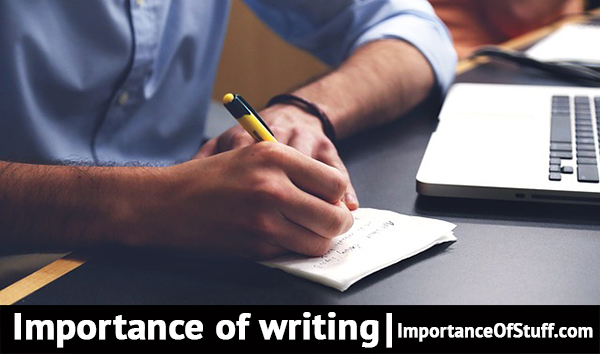 Writing will help your expression and hone your business speeches this will let you effectively communicate with your colleagues and process right command or direction to your employees. This article is spot on. Writing down can change your personality. You get to know so many new things. I have been writing for some time now, mostly blogs and journals and it has improved my vocabulary as well. Everyone should pen down something once in a while.